Sarasota is a city that is just as at risk of being struck by hurricanes as any other city in the state of Florida. This means that any Sarasota homeowner needs to invest in hurricane protection, a level of structural reinforcement that goes beyond normal storm protection. Easy to put into storage, like the calm portions of storm season and the “off-season” of December through May. Relatively inexpensive, allowing you to easily purchase enough to reinforce every window. Durable and resilient to the sort of winds commonly generated during a hurricane. We also offer two varieties of clear paneling that are easily installed with little difficulty. Once installed, you do not need to worry about placing them before a storm, these panels do their job year-round. Lexan panels are “ultra-clear” and feature a corrugated construction. Flat panels can be shaped to order. Furthermore, they actually reject heat, which benefits consumers by insulating the home, preventing heat from escaping the house and making a modest dent in the energy costs of the home. Hurricane season is right around the corner, and now is the time to make sure your property will keep you safe with storm protection. The National Hurricane Center has made some changes for the 2017 season to help keep you safe. While the National Hurricane Center is doing all it can to help get better more complete warnings out in plenty of time to keep everyone safe, it is also up to each household to do their part for hurricane protection as well. Installing hurricane panels in advance of hurricane season is the best way to protect your property and your family. Panels, shutters, screens, and impact film protection can make a huge difference in your personal safety. In addition, many homeowner insurance policies recognize the importance of hurricane prevention measures and will give you a discount on your premiums to help compensate for the cost of instillation. From mid-August to mid-October hurricanes are a fact of life, especially in south Florida. People who live in this area know the importance of storm protection. The time to prepare for hurricanes is now, not in the middle of storm season. Hurricane safe products can not only protect your home, but also save you money on homeowners insurance. There are several improvements you can make to your home to provide hurricane protection that insurance companies recognize as valuable and offer discounts for. – Panel shutters or hurricane-impact glass can protect your windows during hurricane-force winds. – Other types of hurricane panels such as flat or corrugated panels can protect larger openings in your home such as doors. – Screens offer a protection for larger openings, rounded glass, or other odd-shaped openings. Make sure the improvements meet state and county building codes and any regulations by the Office of Insurance Regulation. Your insurance company might want to send an inspector to verify the improvements. The initial investment to upgrade your home with hurricane safe products will be recovered over time by the discount your insurance company will offer. The better quality products that you use, the greater your discount might be. If you live in Florida, then you have insurance on your home or business to cover the damage from a hurricane’s strong winds and torrential rain. Many insurance companies will reduce your rates when you have specialized storm protection devices such as hurricane panels. 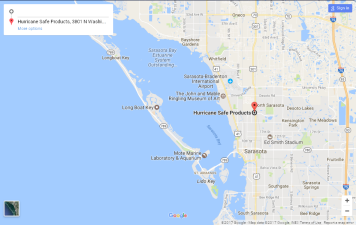 At Hurricane Safe Products in Sarasota, Fla., we have the protective devices required for residential and commercial structures. Hurricane protection devices are essential in Florida to protect a building’s interior from water and wind damage. Hurricane panels are made of durable materials and are designed to slide over a building’s windows and doorways to keep out the water from a storm. The devices are customized to fit properly over a building’s doors or windows, and you can slide the items over the openings quickly. After the technicians from Hurricane Safe Products install hurricane panels on your home or business, we can provide documentation for your insurance company to help you reduce your rates. With high-quality storm protection on a building, your insurance company knows that you are less likely to make a claim for repairs to a business or home. It’s the middle of winter. Do you really need to be thinking about hurricane season now? Yes! Good hurricane protection doesn’t happen in the few hours just before the storm hits. Winter is a good time to evaluate your home or business for storm protection needs, decide which method best fits your building and budget, investigate the options, and determine whether you can do the work yourself or you should hire a contractor. Hammering up plywood panels as the wind is already rising and the rain is falling is sure to leave gaps in your protection and damage your building. It won’t be much fun for you either! By reviewing your options now, you can choose methods that will not only protect your property but can also improve its energy efficiency. Clear Tek flat panels and impact windows, for example, both resist flying debris and also seal out heat and noise and make it harder for intruders to break in. Cheap hurricane panels bought and installed at the last minute won’t perform as well. Don’t wait until hurricane season starts in June to start thinking about protecting your property. Save yourself stress! Call Hurricane Safe Products today and be prepared! Every few years, Sarasota County gets affected by hurricane weather. We have all seen on the news images of boarded-up businesses getting hammered by gale-force winds and water. Having hurricane protection allows us business owners to avoid high costs to repair interior and exterior building damage and the stress that comes along with the cost. Storm protection products like accordian shutters and impact windows can help to keep glass intact and potential looters out of your storefront inventory. While these products are not as cheap as plywood, they tend to be more durable and can save you from additional losses of other windows, doors, or even your roof due to the build-up of air pressure inside a building with one compromised window or door. Having hurricane-mitigation improvements (like hurricane panels) protecting can save business owners on the cost to insure their businesses. Owning a business in an area that is vulnerable to direct or indirect impact of hurricanes means having to take these extra precautionary steps to ensure the safety of your business during inclement weather conditions. In Florida, when there is a hurricane, we know to hope for the best but be prepared for the worst.